I love parties where I get to snack for hours. Cocktail party? YAY! New Year’s hors d’oeuvres? WONDERFUL. Tuesday? AMAZING. The Superbowl adds an excellent level of no-we-don’t-give-a-hoot-about-cholesterol-today-and-if-you’re-lactose-intolerant-watch-yourself, so I’m double happy. So here are some snacky deals that I would not normally put up, but given the sheer amount of snackery to happen, I thought it might help some folks. Frozen pizzas are on sale everywhere. Any of the chicken on sale can be used for buffalo chicken dip (except the ground chicken breast, don’t be ridiculous), which is a football favorite. Wheatsville has all manner of chips on sale, if Lays and Ruffles aren’t your thing. Bluebell is $4.44 at Randalls, and $4.50 at Fiesta. Those are decent prices, but not the best. You might want some because you’re having people over, though, so if you do, go there. Guacamole is on my menu for Sunday, given the cheap avocados. I’ll also likely get out the scale and sort out the Avocado Math that’s been bugging me. Stay tuned. We’re ramping up to the time of year when there is a lot of meat on sale. If you follow the sales you’ll be able to stock your freezer well in advance of summertime bbq parties. This week there are spareribs, chicken parts and sausages all at stock-up prices. NOTE: chicken leg quarters at Fiesta–don’t forget, these are in a big sack of about 10-12lbs. You’ll need to portion these out, don’t just toss the whole bag in the freezer. Unless you’ve got an ice pick and a kid you don’t like much, then go ahead. These also generally have a portion of backbone attached, which I like to remove to make tidier portions. Pirate Snacks, 4-6oz. $1.67/ea Snacks? No. It’s Booty! Last week, if you remember, I got a head start on the scoring by not posting the plan until after dinner on Monday. That’s okay for rookies. But I’m on Week 11 of this Internet Dinner Accountability Plan, so this week I’m getting the post up before dinner on Monday. So I’m already winning this week! Fri: homemade pizza & Family Game night! 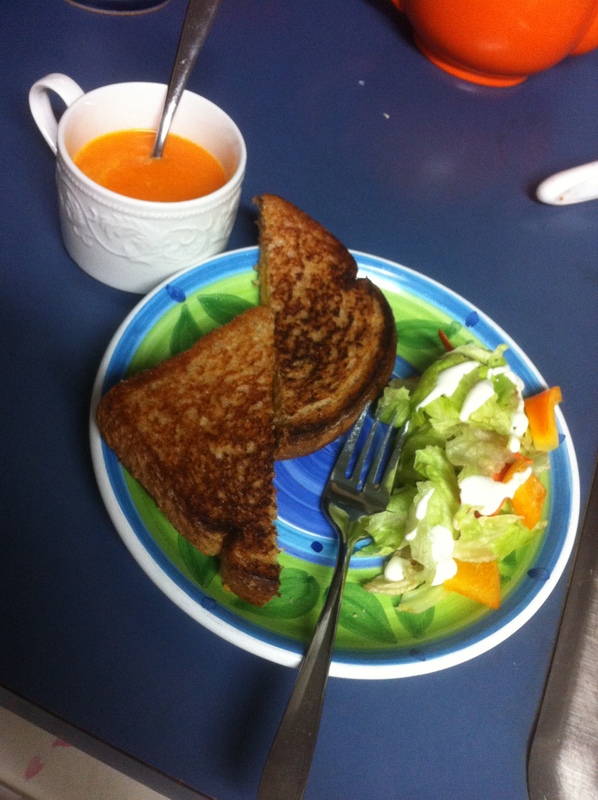 Mon: grilled cheese, carrot soup, salad, apples. 3 points. 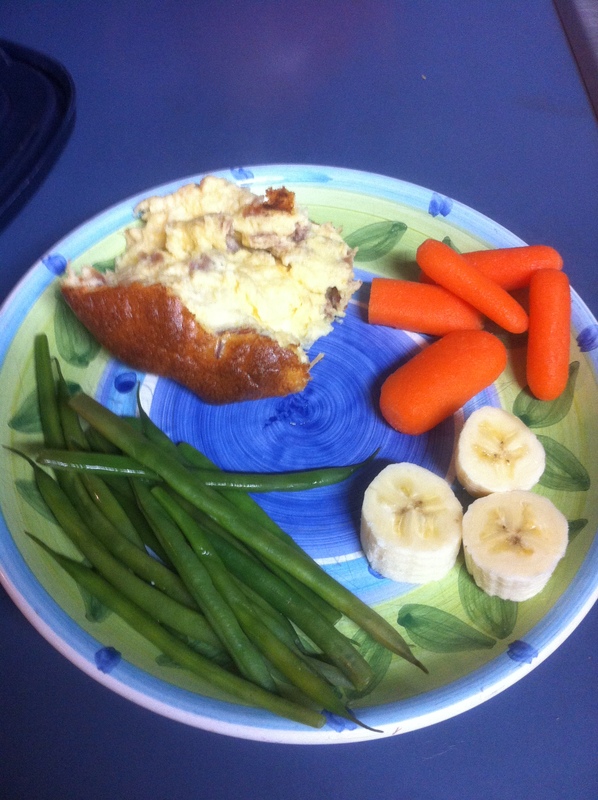 Tues: ham and cheese souffle, green beans, carrots, bananas. 3 points. Wed: beef and barley soup, alfredo noodles, homemade rolls, green beans. 2 points. Thurs: box mac & cheese, leftover buffet. 1 point. 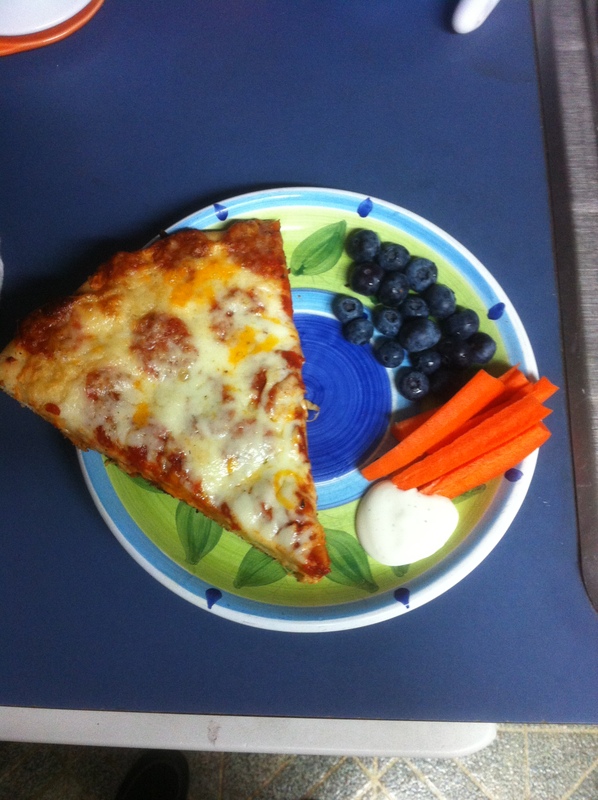 Fri: pizza, red beans & rice, blueberries, carrot sticks. 3 points. No, I don’t know why that second list won’t bullet point when I click ‘Bulleted list’, it always has before. Since we’re focused on dinner, and not formatting, I’m going to ignore it. If you’re too OCD to cope with the lack of bullet points, you’ll just have to draw them in on your screen. I’ll wait a sec. This was not a bad week. I made the souffle I’d wanted to make for a while, and mostly stuck to the plan. Cooking beans is an ongoing problem area in my life, so it didn’t surprise me at all that I had to slide red beans and rice over to pizza night because the beans weren’t really cooked enough to eat yet. Leftover Buffet cleared out the fridge nicely, and with the exception of Date Night we didn’t eat out, so those were additional good points this week. For scoring, the only points lost were for Wednesday, where I took a point off for alfredo noodles, which I only made because I knew two kids would balk at soup, and for Thursday, which was a off-plan non-nutritious meal. Overall, though, we had all five people eating, in the house, a meal I’d planned to cook for most of the week. 12 points to Cheepie! Look at that! Bullet points. Kooky. Let’s see how that all works out, shall we? I’ll post the ad roundup early on Wednesday, so keep checking on me, and don’t forget to post any deals you spot out in the wild! 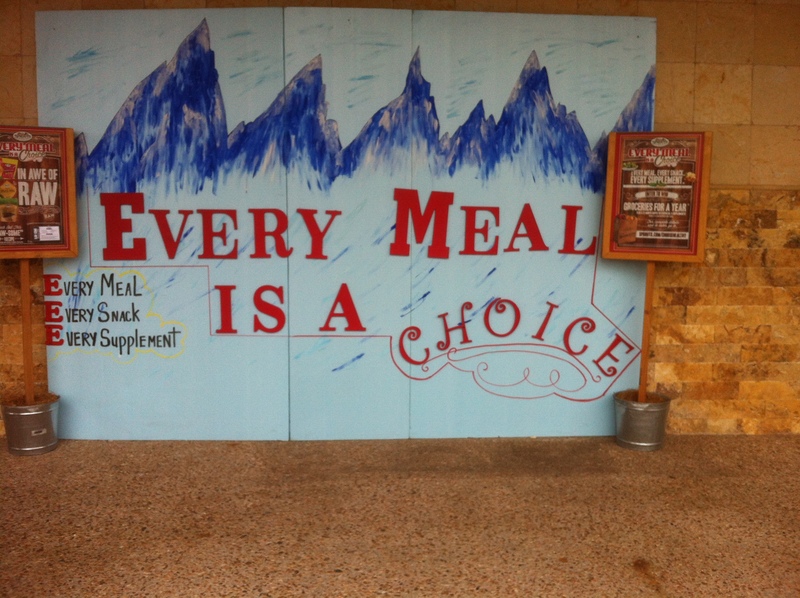 This mural was outside Sprouts when I went the other day. They’re trying to tap into the New Year’s juice cleanse/dieting/this-year-I’m-getting-healthy-dammit crowd, based on the huge display of ‘things you might juice if you like to do that’ just inside the door. It reminded me of the pregnant lady book ‘What to Expect When You’re Expecting‘, with its terrible quote: “Before you close your mouth on a forkful of food, consider: ‘Is this the best bite I can give my baby?’ If it will benefit your baby, chew away. If it’ll only benefit your sweet tooth or appease your appetite, put your fork down. '” That is just a ridiculous thing to tell anyone, and saying this out loud is certainly asking to get slapped by a pregnant woman. That quote has a lot in common with this mural. Yes, there are choices in what we eat, but prioritizing these decisions has become difficult. Eat this tomato, harvested by workers paid a living wage, or this one that was grown nearby? Buy these cage-free eggs, or those organic ones? Are there really any happy chickens? Does this can of beans have BPA? Didn’t they make BPA illegal? Should I eat fish for the omega-3s, or do the toxins make the benefit not worth it? If you try to take it all into account, you’ll be standing there with your cart, unable to even decide which part of the store to start shopping for things. And then you’ll make me mad, because when you do this you’ll be in the middle of the aisle. For Pete’s sake, get to the right! It’s like a road, people. I’ve gone through several ways of dealing with Grocery Information Overload. First, ignore it all and buy what I want. Then there was a serious coupon phase, followed by an all-natural phase. The CSA/Farmer’s Market/Raw Milk period was fun, if pricey. The Whatever the Kids Will Eat period was brief. Which brings us to now: the Best I Can Do phase. The best I can do is use the information I have to make the best choice at the time. It’s an ongoing thing, and changes when I get new information. I evaluate based on budget, health, organic/not, source and a few other things. My decisions might not look like your decisions. I buy 2-3 bags of potato chips a week. They aren’t healthy, organic, or, in the case of Funyuns, even food-based. They are purchased entirely to save my household budget the dent of DH heading out to eat because he feels like eating salty fried things. You might be in a place where the Best You Can Do is solely focused on budget. You might be eating a diet for any number of reasons, so the Best You Can Do prioritizes getting those foods into your cart first. You might be one of those folks using the New Year as a new start and getting yourself over to Sprouts to visit that juicing produce display. It doesn’t matter what kind of shopper you are, spending some time considering what is important when you buy the food to cook meals for your family is. That way, when you’re in the store, confronted with the many questions that come with spending a grocery dollar, you’ve prioritized the things that are important. Pre-running these decisions gives your brain a path to follow. My hope is that CheepieAustin will help you do the Best You Can Do for your family and the meals you cook for them! Cheep Cheep! This week presents with math problems. Skip on down to the deals and you’ll be a-ok to get on with your bad self and get to the shopping. Read on if you want some of the sort of granular analysis I apply to the grocery puzzles I face weekly. I’ve mentioned Avocado Math. This week introduces Berry Math and Kale Math. Kale Math is because of my problem with the units kale is sold in–a ‘bunch’ is just an inherently non-specific amount. Why can’t they just weigh it? Maybe I’ll call some produce folks and ask, since I really don’t want to buy the amount of kale required to sort out which ‘bunch’ is the best unit price. Stay tuned for that post, which I’ll likely pair with Avocado Math because I’m very interested in that as well. Or possibly I just feel I can eat the amount of guacamole that would result without guilt if it’s for Cheepie and Math. Either way, it’s a sacrifice for the greater good. For now, organic kale is 98c-$1.50 and I’m just listing them all because how do I know which bunch is best? Randalls is the winner here. You’re paying decently less if you wait and stock up on Friday at Randalls. We have a unit problem here: ounces and pints. Turns out, if you Google, a good estimate for the weight of a dry pint of blueberries is 12oz. That makes the Randalls deal TERRIBLE. Buy blueberries at HEB. Both berries can be tossed in a Ziploc and frozen after washing. Last, a note on the Fiesta pork special: Sirloin is not the same as loin. Most pork chops that people usually buy are loin:sometimes bone-in, sometimes not, but loin is the most common. Sirloin is a tougher portion of the pig, and isn’t going to cook up the same if you’ve got a favorite pork chop recipe. This is certainly the price to get some and give them a try if your family likes pork, but be aware that ‘grill three minutes on each side and make a dijon sauce’ isn’t going to work as well with these. Randalls came up with a variation I haven’t seen before this week–79c each when you buy 8, on several items ranging from tuna to Gatorade. The items are some of my pantry staples, so look at what they’ve got and maybe you’ll want to stock up. It’s still Randalls, so don’t get distracted and do all your shopping there, but I’ll be getting noodles, tomatoes and tuna. Eldest will also require brownie mix. Happy shopping everyone. If you’ve got suggestions, or find great items, let me know here, or on Facebook or Twitter. It’s week two of the new scoring system, which is based on a 15 point scale. I know, it’s not a nice number like 10, and it makes translating things into percentages more difficult. We’ve all got calculators on our phones, though, so it’s not like you really have to do the math. Thur: I do not remember. I’ve sat here for ten minutes, and no clue. Certainly a downturn from last week! In my defense (I seem to need to use this phrase more often than you’d expect, given that I’m setting these goals myself, not trying to follow someone else’s plan), I was throwing a big event that was using up most of the mental space in my brain that isn’t devoted to the basic mammalian-mom drive of keeping everyone alive through another day. And Thursday? It wasn’t that long ago. Why don’t I remember what I fed everyone? I think it must have been grilled cheese. Making grilled cheeses is so automatic that my brain doesn’t even register it any more! So out of a possible 15 points, this week gets 5 points. Monday gets two for having all the food groups and three people, Wednesday gets two for being a planned meal (if for a different day, I’m taking what I can get this week) and being nutritious, and Friday gets one for being planned. Tuesday and Thursday are zero, because while I want to say Taco Cabana is at least three food groups, the amount of salt on that chicken negated any possible nutrition involved. Luckily, the weeks roll on and I’ve got a new chance every seven days. This week I’ve got a head start, since I know darn well what I fed everyone last night. Grilled cheese. Wish me luck, and check in tomorrow morning (or very late tonight for the Happy Ad Wednesday post. This week went fast. I didn’t really think I was due for another post, but just like every Tuesday both HEB and Sprouts emailed me the circulars for the new ad week and here we are. If ‘here’ is wondering why my mailman continues to deny me the simple pleasure of weekly grocery ads made of paper. Stock up items this week are boneless skinless chicken breasts, pork chops, and berries. Note: I’m not including Sprouts’ specials from last week, but they’re still good today! Doing that was making their entry too long. You can check last week’s post if you want to review what is still up for grabs. It’s a good week for most places, but Randalls is lagging as usual. Freezing pork roasts is a great way to have a meal in the freezer (I cut to 1.5lb sections and vacuum seal), and freezing. Sprouts also has eggplant 2/$1, but that seems like a misprint–more likely 2lbs/$1. Annie’s products 50% off for selected varieties, and all sausage is $3.99/lb, no nitrates, made in-store–these are both good deals. The avocado math problem has been bothering me. I’m going to have to address it soon, maybe for the Superbowl, when I can likely bring a gallon of guacamole somewhere without anyone wondering why Cheepie is carrying a giant vat of guacamole. It’s really bugging me that I’ve got extra large avocados for $1.50, and large for $1, and sometimes there are just no-adjective avocados for 58c. What is the best deal? Which will allow me to eat the most chips? I’m going to have to develop a system, get out the scale, and sort this out. Look for Avocado Math Post soon! Fiesta has Bluebell for $4.99/ea, which isn’t the best price, but if, like me, what you thought would be six months worth of ice cream last time it went on super-sale turned out not to last that long, you might want a few. Since a not insignificant amount of my parenting turns out to be based on bribery via Bluebell, I’ll be grabbing a few. Go forth and stretch that grocery dollar, Cheepsters!